Welcome to Cure JM! 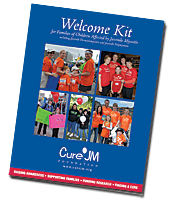 By registering as a Patient and/or Parent, you will receive a Welcome Kit, brochure, information cards and Cure JM awareness wristbands. You will also receive the latest e-news from Cure JM, including information about events in your area. You will also have the opportunity to join the (optional) Family Support Network, where you can be connected to other families affected by this disease. At the same time, you will be actively engaging in the movement to find therapies and a cure for Juvenile Dermatomyositis and Juvenile Polymyositis. Your information will be DE-IDENTIFIED, meaning your name will never be disclosed to researchers WITHOUT YOUR PRIOR CONSENT. The only information provided to researchers would be demographic information and patient data, without any direct identifiers, such as your name. This data is absolutely essential to advance JM research. Both patients and parents hold the key to unlocking solutions---your information, your history, and your help can provide the answers toward a cure for JM! Thank you for joining the fight for a cure. If you have any questions or any problems with the registration process, please contact . Click here if Patient Address is the same as above. Where (geographically) did symptoms first appear? Cure JM also supports grandparents of patients diagnosed with JM. Grandparents also receive a Welcome Kit, awareness wristbands, our monthly e-newsletter, and invitations upcoming events in your area. Most of our Cure JM grandparents find it extremely helpful to connect with other grandparents of JM children.